Our mission at Christ the King is simply to Love God, Love Others, and Make Disciples. 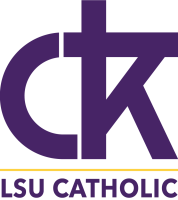 CTK has many different ways for you to get involved. Please continue to explore the website for opportunities that speak to your unique gifts and talents! Click below to learn more! LSU FACULTY & STAFF - JOIN OUR LIST! Click here for a complete list of CTK Hours & Mass Times!